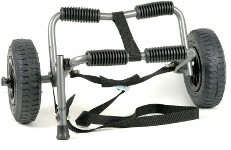 If you don't want to carry your canoe or kayak from the car to the water then a canoe & kayak trolley is the answer. The trolley will take the weight of the canoe or kayak whilst you pull it along and steer. 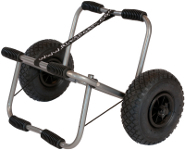 The C-TUG Trolley with Sandtrakz wheels from Railblaza makes it easier you to move your kayak or canoe over any surface including soft & harder ground. 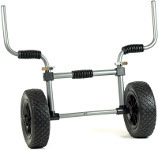 Compact trolley for transporting sea kayaks smaller touring boats and ww kayaks. Folds up neatly, wheels are removable. Trolley. Includes a stand for ease of loading. Stable trolley for transporting open Canadian canoes and larger kayaks. 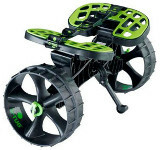 Large foldable frame and wheels than the Kayak Trolley. Includes a stand for ease of loading. A Sit On Top Kayaks Trolley that adjusts the fit the majority sit on tops available on the market This trolley is designed to fit to sit-on-top kayaks through the scuppers holes. 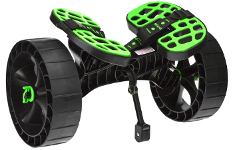 The C-Tug trolley with Puncture Free Kiwi Wheels, with hi-grip tread, in place of the old-style pneumatic wheels, no more flat tires. 120kg static loading capacity with fast assembly & disassembly for easy transport & storage.